This image was taken in my natural light studio. 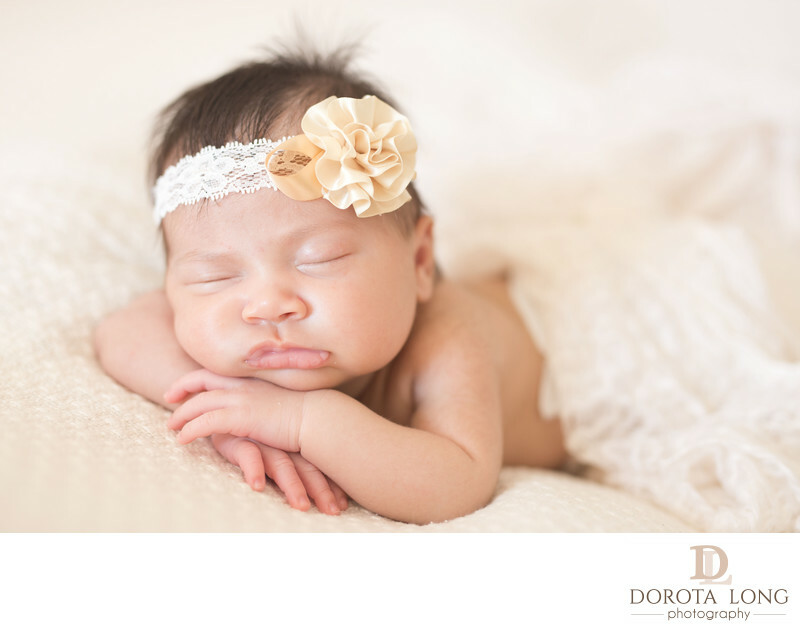 Newborn baby sessions can be challenging sometimes because in order to get the nice newborn poses we need to make sure the baby is deep asleep. Once the baby is asleep we are able to put her in a comfortable position. In this image I placed little baby Sarah on a bean bag and carefully undressed her. I put a head band on her head, very carefully, making sure she does not wake up and then covered her with a light blanket. Some parents do not like it when their babies are naked and I like to make sure all my clients are happy so just in case, I take most of the photos with babies dressed or covered with a nice matching blanket. The tones in the image are light and airy and the blanket, head band flower and the backdrop are all in the same color tone family. This little newborn baby girl photo session went very small. Even though she was older than the recommended 12 days old or younger, she was able to sleep through the whole newborn baby session! I was incredibly happy with how the photos turned out. But, what is always the most important for me - the mom was super happy as well. I always strive to deliver images that will make my clients happy, and I can was very happy to see another happy client.